Ten years after his passing, WWF South Africa remembers conservation champion and staunch WWF supporter, Hans Otto Hoheisen. 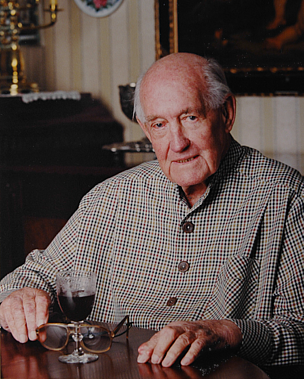 By a quirk of history, Hans Otto Hoheisen (1 March 1905 – 8 July 2003) spent an impressionable part of his childhood in the bushveld near the southern border of the Kruger National Park. It was an experience that sowed the seeds for his unique legacy: a profoundly beneficial and lasting impact on nature conservation in the sub-continent through generous donations and wise actions during his lifetime and, after his death, through his very considerable bequest to the Hans Hoheisen Charitable Trust that bears his name. Hoheisen was the son of Alfred August Hoheisen, a German building contractor who had immigrated to South Africa in 1903. Hans was born in Braamfontein two years after his father’s arrival. Because he was a German citizen, Alfred Hoheisen was interned in the Baviaanspoort camp in Pretoria during World War I. It was a grim experience for the master builder, but during that internment his wife and children lived on a farm in Hectorspruit, near the southern border of the Kruger National Park in Mpumalanga’s Lowveld, and it was here that the young Hans was first exposed to the bushveld, the conservation of which was later to become his abiding passion. When his father died in 1965, Hans Hoheisen inherited the Timbavati farms. Doubtless spurred by his childhood memories, he became an ardent conservationist and developed these properties into a secure refuge for wildlife. He built the Hans Hoheisen Wildlife Research Centre near the Park’s Orpen Gate, becoming the first private land owner to allow The University of Pretoria veterinary students to do research field work on his property. In 1990 Hoheisen donated 13 833ha of his Timbavati land to WWF South Africa. In 1992 he acquired the farm Ngala in the same area which he also donated to WWF-SA, and which with the other properties became the Ngala Game Reserve. Hoheisen also donated land for the establishment of the Southern African Wildlife College, a project conceptualised in 1993 and established in 1997 by WWF-SA through a grant by the German Ministry of Economic Cooperation via the German Development Bank. This R20m project continues to train students to manage protected areas throughout the continent.